Janet Yellen isn't doing gold bugs any favors. 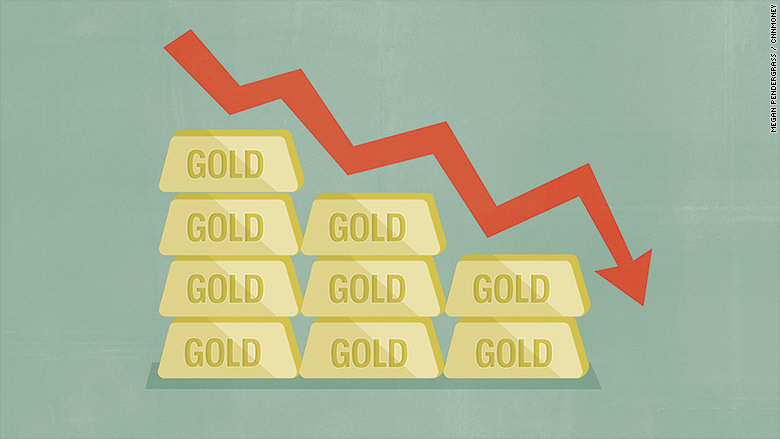 Gold prices tumbled 2.5% on Thursday to $1,049.60 an ounce -- the lowest level since October 2009. It was gold's worst day in nearly two months. 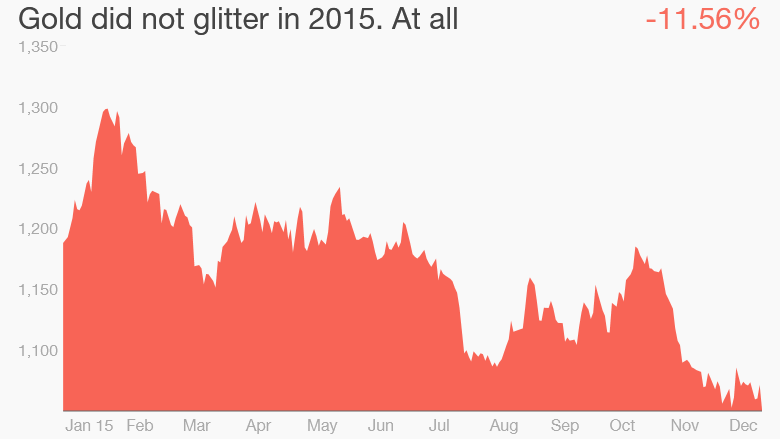 The precious metal is down 11% so far this year. The latest blow to gold was sparked by the Federal Reserve's decision to raise interest rates for the first time in nearly a decade. The historic move, led by Fed chief Yellen, is a big negative for gold because it lowers the chances that near-zero rates cause a bout of severe inflation. The rate hike also sent the U.S. dollar sharply higher on Thursday as it signals Fed confidence in the health of the American economy. None of that is good for gold, which tends to rise when people are worried about inflation or the stability of the economy. "Gold is a very effective hedge against inflation but the global landscape is dearth of inflation," said Peter Kenny, an independent market strategist and founder of Kenny's Commentary. In fact, many economies, especially Europe and China, are dealing with the bigger risk of deflation right now. "Gold will continue to weaken. Today's lows are probably not the lows we're going to see next year," said Kenny. Gold's heyday was during the 2008 crisis when people flocked to the metal as people feared a collapse of the global financial system and stocks crashed. Before its recent decline, gold continued rising to nearly $2,000 an ounce in 2011 as the Fed pumped money into the economy at an unprecedented pace, setting off concerns of inflation. Some believe gold is poised to rebound from a difficult 2015 as investors rethink the likelihood of future rate hikes from the Fed. "When the dust settles, gold will do just fine," said Axel Merk, founder of Merk Investments, which specializes in currencies and gold. Merk doesn't buy talk that the U.S. dollar is "going through the roof," arguing it will stop rallying as people realize the Fed is unlikely to aggressively raise rates. He also suggested that future Fed action might "create more havoc" in the stock market, which can drive gold prices higher. In any case, the latest selling in gold drove down shares of metals and mining stocks on Thursday. FreeportMcMoRan (FCX) plunged nearly 9%, making it the worst S&P 500 stock and leaving its shares down by 74% so far this year.